What companies need to knowand doto win and hold on to tomorrow's best employees The workplace of the future is being shaped today by Web 2.0a collection of breakthrough social media technologiesand by the Millennial Generation, people born between 1977 and 1997. The convergence of these emerging workplace trends has created a generation of hyperconnected workers who are placing increased pressure… on employers to overhaul their approach to talent management. In The 2020 Workplace, human resources experts Jeanne C. Meister and Karie Willyerd offer a practical game plan companies can use to attract and keep these employees, and, in doing so, transform their organizations; achieve compelling business results, such as increased innovation and improved customer connectedness; and compete more effectively in the global marketplace.Based on key findings from two surveys of global professionals, as well as case studies from organizations such as Deloitte, Cisco, Bell Canada, JetBlue, Nokia, and NASA, this book shows how the social technologies that are used outside the company in marketing to connect with customers can be adapted for use inside the company to connect with employees. Meister and Willyerd bolster their thought-provoking research with real-world examples of these practices in action, including a YouTube new-hire orientation contest, the use of Twitter for sourcing job candidates, and a video game for new hires. 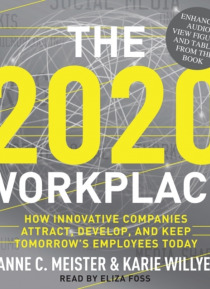 With twenty predictions for the 2020 workplace and a glossary for those who have never texted, posted to Facebook, or Tweeted, this book is a must-read guide to what companies should doand are already doingto create tomorrow's workplace of choice.